﻿﻿﻿﻿﻿﻿You won’t find the recently discovered Houston burrowing crayfish in your etouffé. ﻿﻿﻿﻿﻿﻿﻿﻿﻿On an early spring trip to Angleton, just southwest of Houston, I watched the roadside carefully, hoping to catch a glimpse of unusual structures on the ground in this low, wet corner of Texas. And there they were, the telltale signs of some unique Texas animals. 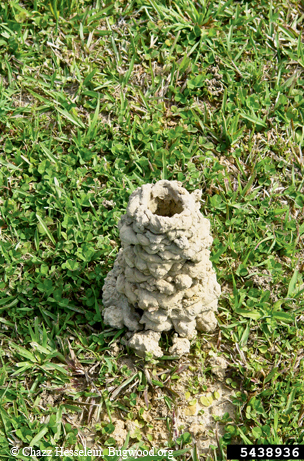 Scattered along the grassy roadsides of County Road 171 and up into residential lawns were 3- to 6-inch-tall edifices of dark mud jutting out of the ground. A closer look at these structures revealed that they were composed of pellets of mud piled one on top of another, often with a vertical tunnel descending into the subterranean depths. Chimney built by burrowing crayfish. The earthen totems or “chimneys” are built by crayfish, but not the stream- and swamp-dwelling kind. These crayfish (known as primary burrowers) rarely visit open bodies of water, preferring to spend their days in water-filled chambers three to six feet underground. Burrowing crayfish are seldom seen, exiting their burrows only in spring and summer on rainy or very humid nights to forage for food or search for mates. Their chimneys typically stand testament to wet ground, where the water table is very close to the surface. More than 40 crayfish species occur in Texas, with the low-lying, humid southeastern corner of the state hosting the largest number of species. Many crayfish species found here are endemic, occurring nowhere else in the world. About a half-dozen burrowing crayfish species occur in southeastern Texas. One of these, the Houston burrowing crayfish, was discovered and described in 2008. Currently, this species has been found in only a handful of counties north of Houston. If you drive through Grimes, Liberty or Mont­gomery counties and spy roadside crayfish chimneys, they will likely represent the work of this Texas-only species. While found along roadsides today, the Houston burrowing crayfish was likely a historic associate of the wet coastal prairies that have since been converted to agriculture or lost to development.